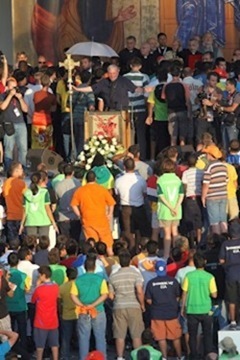 As you may know, this week I returned from attending the World Youth Day encounter with the Holy Father in Madrid, Spain. 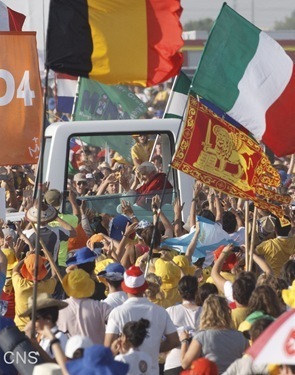 World Youth Day was a very important part of the legacy of Blessed Pope John Paul II and his love and ministry to young people in the Church. 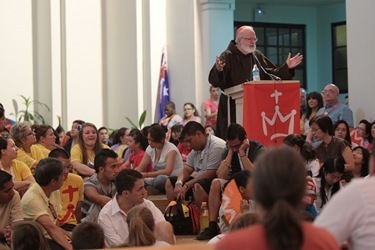 It has touched the lives of many millions of young people and helped them to experience the catholicity of the faith, to deepen their commitment to the Lord and their sense of being part of Jesus’ family in the Church. In general, the young people who go have a wonderful experience. 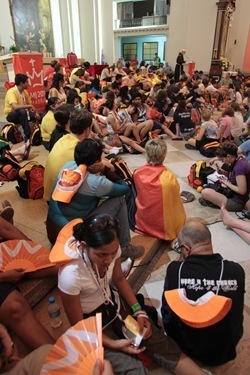 It is a great institution in the life of the Church and there’s no other gathering of young people in the world that consistently brings together the numbers that World Youth Day does. 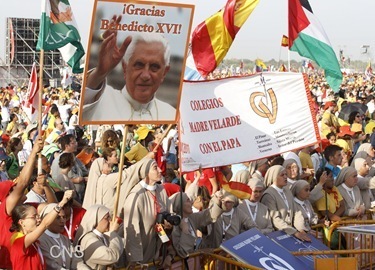 It is also a great blessing for the place that hosts the World Youth Day gathering. 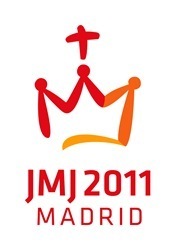 The first World Youth Day I attended was in Denver. I remember the people there were alarmed that this was going to take place because they imagined it was going to be like Spring Break in Fort Lauderdale, and the young people would trash the city! And yet, afterwards, they were all shocked that there was not one incident and that kids were so well behaved and had such a wonderful spirit. The joy that they brought with them was a gift to the whole city and that is an experience that has been repeated over and over again. I was also impressed by the volunteers from the parishes. There were thousands of volunteers who just were so helpful in organizing and directing people and helping them and making sure that everyone had what they needed. 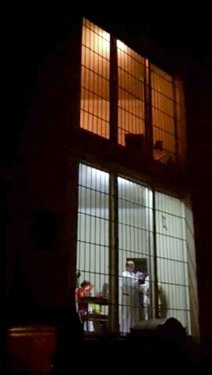 The Holy Father had a meeting with them before he left to thank them for their generous service. 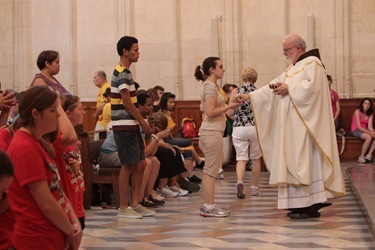 I think the presence of so many young Catholics was a great consolation to the Church in Spain, which has been suffering from the secularization of Europe. As I mentioned in my post of August 12, I would like to share some of my experiences with you. 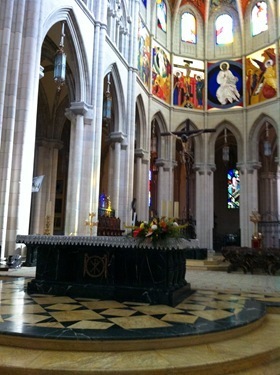 On Monday, we went with the pilgrims to Toledo and there we had a liturgy in the church of San Juan de Los Reyes — a church that had been built by Queen Isabella and King Ferdinand, the so-called “Reyes Catolicos” (the Catholic Kings). 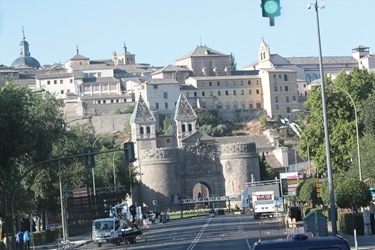 Toledo is a very ancient city, it’s the primatial see, the oldest diocese in Spain. It’s a beautiful walled city with many medieval and ancient buildings. 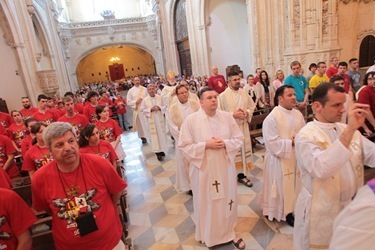 At the Mass, we had a lot of our priests concelebrating; the church was filled. 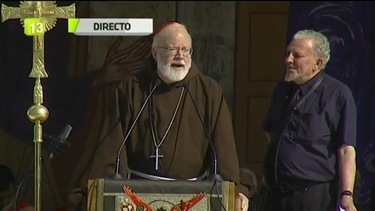 I spoke to the pilgrims a little bit before the Mass about the history of Toledo. It is an interesting history of great cooperation and peace among Christians, Muslims, and Jews. Evidence of this is the old synagogue, which is one of the very significant buildings in Toledo. 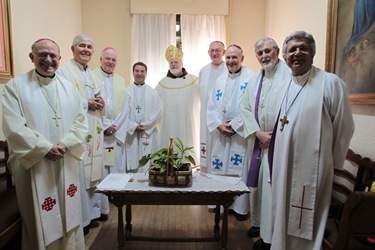 As Catholics we must realize that, although many Spaniards perhaps went to the New World looking for gold or for fame, there were many who went with a sincere desire to spread the Gospel — people like Blessed Fray Junípero Serra, the Jesuits working at the reducciones in Paraquay and so many other great missionaries. So many charisms have come out of Spanish Catholicism. 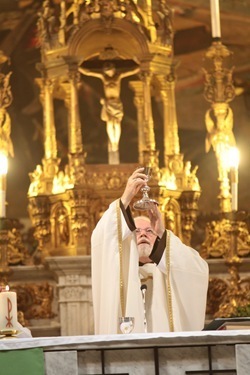 In Spain, we saw the founding of the Jesuits, the founding of the Dominicans, the reform of the Carmelite Orders — very important spiritual traditions in our Church. And in more modern times, we have the formation of many realities such as Cursillos de Cristiandad, Marriage Encounter, The Neocatechumenal Way and Opus Dei. In Toledo, after the Mass one of the things that I did was to visit the Church of Santo Tomas, where the most famous painting of El Greco still is, as a mural on the wall over the grave of Conde de Orgaz. We were on our way to the Cathedral and I said to the taxi driver “Is the El Greco museum open?” And he said we would drive by it, as it was on the way. When it was closed he said “Well even though that’s closed, I’ll bet the church is open and that’s where the best one is.” I said “Definitely.” In fact, it is my favorite of his paintings, and so I was very happy he took us there. 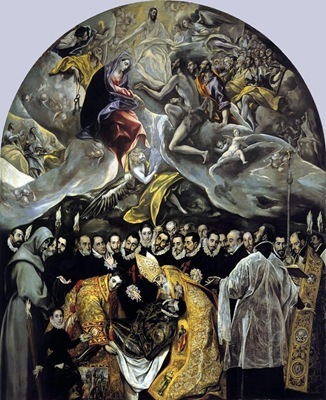 The painting is called The Burial of Conde de Orgaz (The Count of Orgaz). He was a very pious layman and, according to legend, St. Stephen (on the left) and St. Augustine (on the right) appear from heaven to bury him. An angel is carrying his soul up to heaven and we see the Blessed Mother, John the Baptist and St. Peter waiting in heaven. On St. Stephen’s dalmatic, there’s one panel showing his martyrdom. And his face is actually reflected in the shiny silver armor of Conde de Orgaz. It’s a magnificent painting, probably the best of El Greco. El Greco was himself from Greece, but lived many, many years in Toledo and did many of his paintings there. 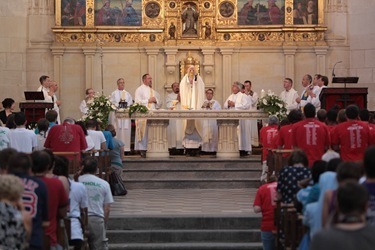 In the days leading up to the meeting with the Holy Father, a number of bishops and cardinals were asked to give a catechesis (which is a conference on the faith) for the pilgrims. I was one of eight English speaking bishops to be asked to do that, and so I spoke Wednesday, Thursday, and Friday in three different churches. There were three themes we were asked to speak on: Faith, Established in Christ, and Being a Witness. Following these talks the young people could come up to the microphone, ask a question, and I would try and answer them. 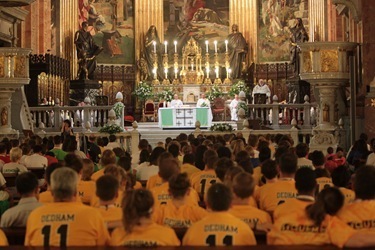 We ended each session with a Mass. 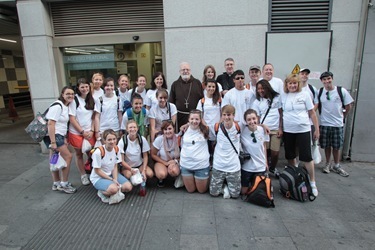 Some of our Boston pilgrims went to all three of my sessions, but the main group came on Thursday. On Wednesday, I had Catechesis and Mass at San Juan Crisóstomo, a diocesan parish. 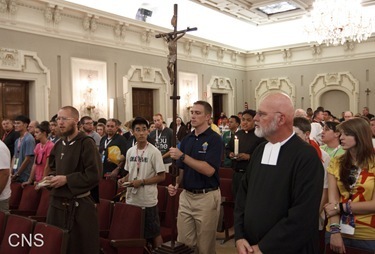 Then in the afternoon I preached at a vocations service, which was organized by the USCCB, at a Jesuit parish San Francisco de Borja, which was packed. On Thursday, I was at the Capuchin church, San Antonio. 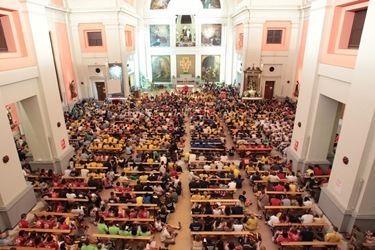 It was a very large church and I would say there were over a 1,000 young people at this Catechesis and Mass. The church is in a working class neighborhood where most of the parishioners are Latin American immigrants, which I found very interesting. It was much like my ministry in Washington D.C.; the parish had a clinic, and all kinds of social services. The main Boston group was there and it was nice to see them again. 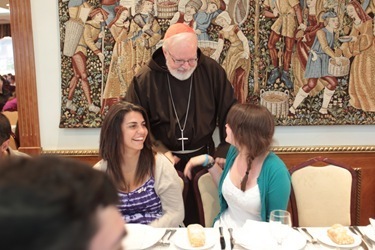 Then afterwards I had lunch with the Capuchin community there. 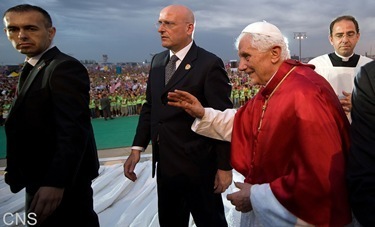 That afternoon was the welcoming ceremony for the Holy Father. On Friday, I had another Catechesis at the church of Nuestra Señora del Rosario de Filipinas, a Dominican church. Friday night there was a Stations of the Cross at the main venue for the week’s activities called Plaza de Cibeles, which is in front of a Baroque white building that was originally the old post office. It’s now the city hall and they put a stage up there and that’s where the opening service was with the Holy Father as well. The stations were very well done. They brought what the Spanish call pasos, or floats, that they use for the processions on Good Friday and during Holy Week. They came from cities all over the country and some of them were just gorgeous. They also had a young man singing what they call “Saetas” to the Virgin. It’s interesting because when you hear it you think this is a Jewish cantor in a synagogue or it’s a Muslim singing from a minaret—it’s so Middle Eastern. And yet these are the songs they sing in Spanish to Christ and to the Virgin. The Saetas means like an arrow, and it is certainly a very piercing, beautiful and haunting melody. 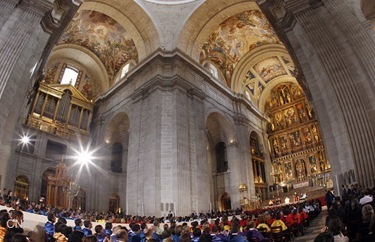 This day the Holy Father went to El Escorial, which is the university where I taught back in 1970. He met with the nuns and the university professors there. This is a beautiful old monastery that was built by Phillip II who lived there as a monk with the Jerónimos, a very important order at that time in Spain. 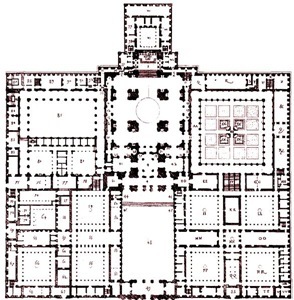 He built that monastery to commemorate a victory over the French, I believe on the feast of St. Lawrence. He built it in the shape of a grill, since St. Lawrence had been martyred on a grill. I was very happy to be able to teach there because they had a wonderful library, which I made good use of. They also had a number of original works of Santa Teresa and many of the Spanish mystics and I was writing my dissertation on the Spanish mystics. 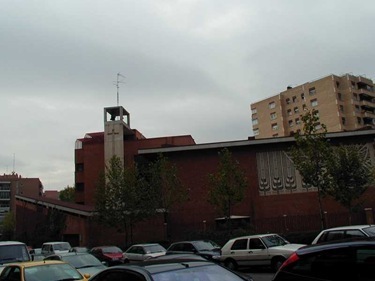 As I said, I was invited to attend, but we were having a Mass for the Boston crowd at the largest church in Madrid, which is San Francisco el Grande. I had never been in that church and Father Matt Williams came up with the idea. It’s a stunning church, it really is monumental! I don’t know how many were there, but it seemed like a couple thousand people — quite a big crowd! Right next to where the bishops were staying there was a cloistered convent of Dominican nuns. One night I went in to pray my office there, and they were having a service, so I stayed for part of it. In the pictures you see (though they are a bit dark) there are two levels of grills. The upper level was where the nuns were and the second level down below there was a choir. But in the center of the sanctuary, you will see that there is the baptismal font that St. Dominic was baptized in. That was sort of the center piece of this service. So we renewed our baptismal vows, they sprinkled us with water from that notable font and then they had witness talks by a cloistered Dominican nun and by a friar—who spoke very, very powerfully. 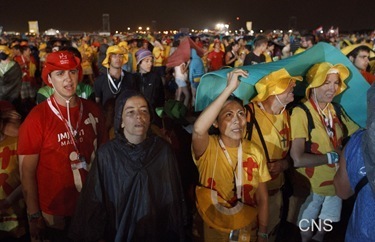 Saturday night was the vigil with the Holy Father at Cuatro Vientos airbase. Of course, one of the most memorable aspects of the vigil for anyone who was there was the torrential rain that hit not long after it started. 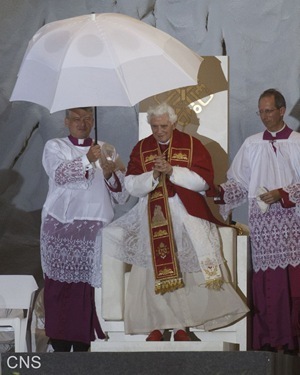 I suppose it shows that I live in New England, but I think I might have been the only bishop who brought an umbrella. I had heard on the news that there might be rain, so I took it with me. And when the rain came, they brought out these big white umbrellas for the bishops to use, and they quickly turned inside out. Meanwhile, my little black collapsible umbrella was probably the only one that was really functioning! 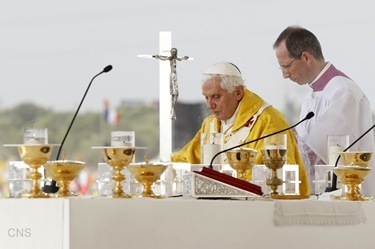 Unfortunately, the Holy Father’s homily, in which he was going to respond to questions that had been submitted by a number of young people, was destroyed by the rain. It put me in mind of a Mass I once had at the National Shrine of the Divine Mercy in Stockbridge. We often had inclement weather on the feast day and we thought that we had solved the problem by putting my homily in plastic page protectors. But on that day it was raining so hard, and there was so much rain on my glasses, I couldn’t read it anyway! It was still a very moving service, and after the winds and rains died down, which was rather quickly, we had the Holy Hour and the consecration to the Sacred Heart. 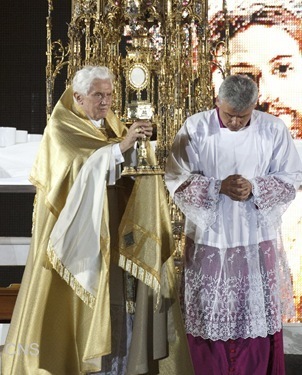 The monstrance from Toledo that they used for the Adoration was quite impressive. 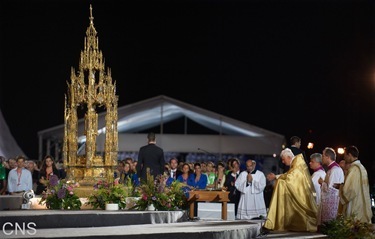 If I am not mistaken, I think it is part of an even larger monstrance that’s actually horse drawn and was pulled through the city of Toledo for the feast of Corpus Christi. 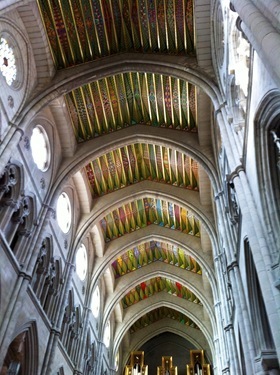 Even more impressive, though, was the reverence of the pilgrims. 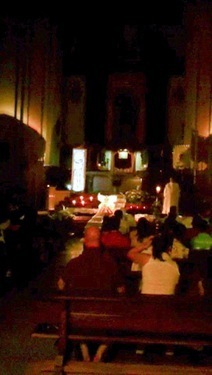 The crowd stretched as far as you could see and yet, during Adoration there was great quiet. 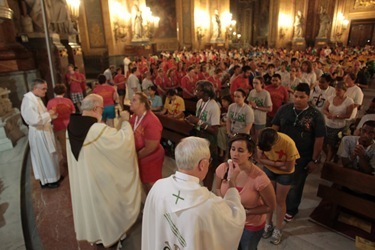 After the vigil, the young people spent the night there, but we left around midnight and came back at 5 o’clock in the morning for the Closing Mass. The Closing Mass on Sunday was very lovely, but it was also very warm. 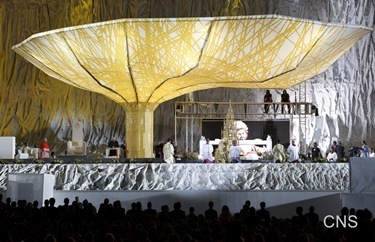 King Juan Carlos I and Queen Sophia were seated next to the Holy Father on the platform. 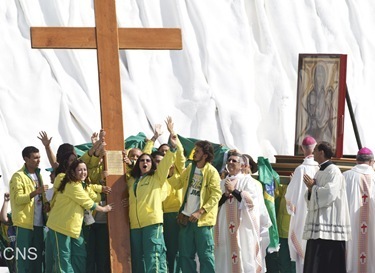 At the end of the Mass, the Holy Father announced that the next World Youth Day would be in Brazil and the Brazilians came up and got the cross and the icon and then we prayed the Angelus. On Sunday night, we had a goodbye dinner with some of the Boston pilgrims at a restaurant called Rio Frio. I think it was the only thing about Spain that was frio! 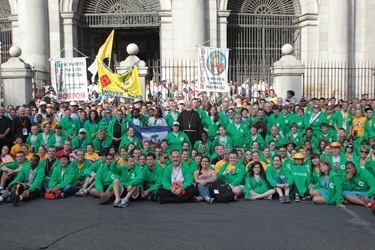 Typically on the Monday after the World Youth Day Closing Mass, the initiators of the Neocatechumenal Way hold a gathering for the members of the Way from around the world and also a number of bishops and cardinals. 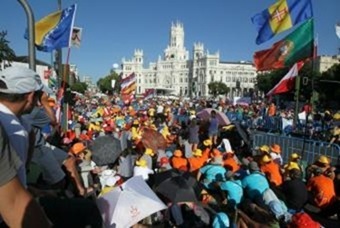 This gathering, like many of the World Youth Day events was in the Plaza de Cibeles. 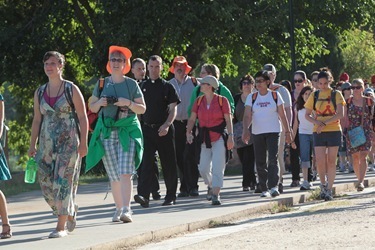 I was asked to attend, and we had group of about 130 pilgrims from Boston there. 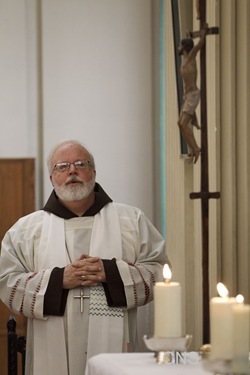 As he usually does, Kiko Arguello, one of the initiators, gave a period of catechesis, after which he invited young men and women to offer themselves to discern a vocation to the priesthood or consecrated life. 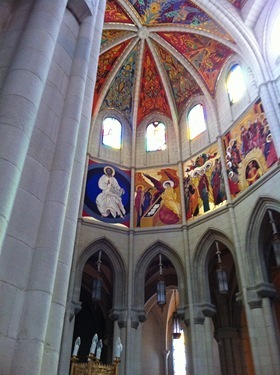 Those who feel called are asked to stand and then come up to the stage to receive a blessing from one of the bishops. Later, when they return home, they will receive additional formation and spiritual guidance to continue their discernment. As always, it was quite impressive. Of the about 200,000 young people there, I understand about 8,500 came forward — about 5,000 young men and more than 3,000 young women. I was very pleased to give many of them my blessing. 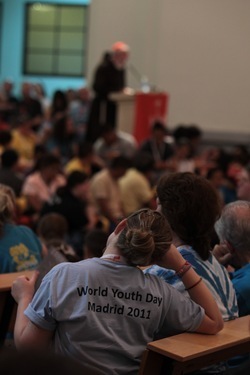 It was very fitting end to World Youth Day.